Soft and ready to use right from the package. Plus the product stays soft until baked. Work on projects for days without worrying about dry-out. Bakes in the oven in minutes. 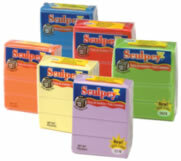 This very versatile clay can be sculpted rolled cut painted and extruded through the Sculpey® clay extruder to make just about anything. Great fun for everyone! 2 oz. bars.